What kind of Renegade are you? How many training blocks do you need in a week? Today is usually a Rest Day, however I released a new training plan template earlier this week that includes an Endurance/Active Rest Block and an Olympic Lifting Block. Depending on what type of Renegade Athlete you are you may want to take a rest day or you may need to hit one or both of those blocks. In the coming week I’ll be highlighting the different types of athletes that have given Renegade Rowing a shot. I hope to shed some light on the possibilities that exist in developing a broad, general, and inclusive fitness to allow for sport specific performance no matter what level you’re at. One group I’m working with is 4 High School Rowers who train with me three times a week in order to prepare for making their team and the rigors of winter training. A second group is the Boston College Men’s Crew Team, who not only rows on the water most days of the week, but manages to get in to the gym once or twice to get stronger and become more dynamic athletes. A third group includes members of CrossFit Boston who would like to compete at CRASH-B’s and learn to race on the water. And last, but definitely not least I’m privileged to help a competitive masters rower fight his way to elite status. All of these athletes have different needs and the template I’ve created is a step in the right direction of helping them find the right amount of general and specific preparedness to reach their goals. 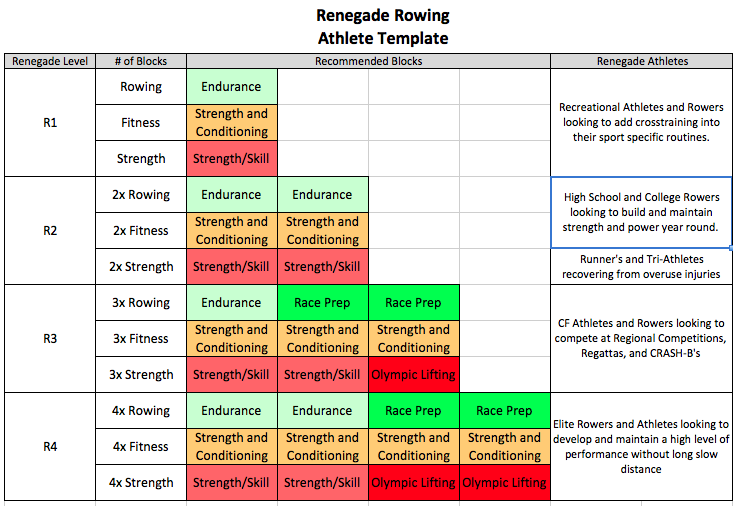 Please take a look at the Renegade Rowing Athlete Template below and share your thoughts on where you are and how many blocks you currently use in training. I will be making adjustments as we go and continually striving to give you good examples of how this works and why it works. This entry was posted in Motivation, Our Mission, Rowing and tagged balance life, endurance sports, exercise, functional movements, inspiration, people, personal experiences, rowing, sports, training by Renegade Rowing. Bookmark the permalink. Awesome stuff! I love the way you’ve organized your training templates. I will be following these myself and incorporating some of this into the row classes I teach. Awesome! Thanks Leeny! Where do you train/teach? I am a CrossFit trainer and UCanRow2/Concept2 certified rowing coach and I teach at CrossFit St. Louis. I’ve developed a class at our box called CrossFitSTL-Row that is similar to a crossfit class, but with row technique, strength and a rowing wod emphasis. My athletes don’t simply hop on an erg…they learn how to be efficient and hone in their technique. Lots of meters in that hour. I have learned a lot from your blog and incorporate many of your rowing drills into the first half of our hour. From stroke rate drills, to working on rhythm and ratio, to speed and/or endurance intervals, we do it all. My athletes are diverse but all come to work hard and improve their rowing on the erg. It’s my favorite class to teach. I am so grateful for all the amazing information you’ve shared on your blog. It is a huge resource for me as I continue to learn and improve my teaching. Looking forward to see what next week’s template brings. Awesome! Thanks Leeny! Sounds like you guys have a great group! I’ll do my best to keep the info flowing. Keep having fun and spreading your passion for rowing!